Prepared pomegranate seeds are attractive but whole seeds are cheaper. 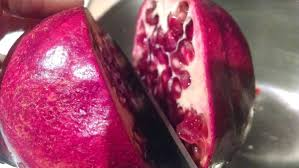 However, you may end up creating a purple mess in your kitchen if you do not know how to cut a pomegranate properly. You will find a compete tutorial on how to chop the delicious fruit the right way in this article. You will need a bowl, cutting board, and a proper knife. Let's get started now! 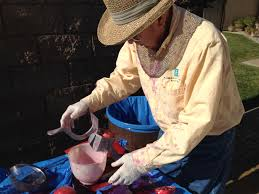 Wear protective clothing like an old t-shirt to avoid staining your clothes with the pomegranate juice. Use a plastic board because the juice will stain a wooden board. Work near the sink and have a large bowl to put the cut fruits. 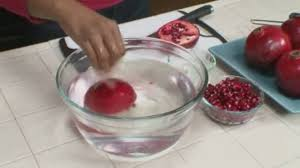 Slice a quarter inch from the stem of the pomegranate using a sharp knife. Place the cut fruit on the cutting board with the cut side down. Then remove the crown of the pomegranate using a paring knife. Cut along the gentle ridges on the outer part of the fruit. Cut through from the blossom end to the stem end through the red skin. One useful tip on how to cut a pomegranate is to make at least 6 cuts. 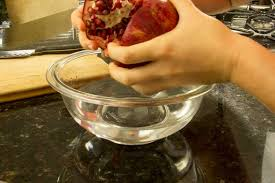 If you cannot locate the ridges, make shallow and gentle cuts around the pomegranate. Do not cut the seeds in the fruit. 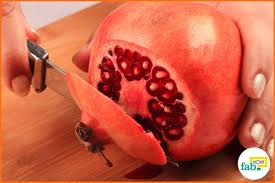 Pry the pomegranate open through the cuts with your fingers. 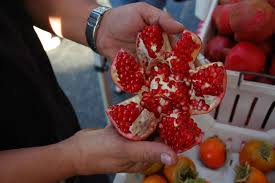 The pomegranate will open and expose its seeds or arils. Open the sections over a large bowl so that loose seeds will fall into the bowl. 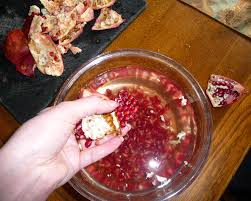 Pry away all the seeds from the membranes and peel into the bowl. You can add some water to the bowl such that the seeds sink to the bottom while the membranes float. Separating the two in water is easier. You can also pry the seeds under running water to avoid staining your counter. After removing the seeds from the membrane and skin, remove the floating membranes and strain the seeds. Place the seeds in a serving bowl and enjoy. Be careful not to drop any seeds on the floor or light carpet because they will leave stains when squished. Eat the seeds immediately or store them chilled for 3-4 days in an airtight container. Step 1: Cut the fruit into two from top to bottom. You do not have to remove the calyx. Cut along the midsection to avoid spilling its juice. Step 2: Fill a bowl with water and place the two halves in the water with their faces down. Pry the fruit open while still submerged if it is just scored. Keep the skin side up so that you can prevent juice from staining everywhere. Step 3: Remove the seeds with your fingers including those close to the skin. Remove all seeds and the white pith. Step 4: Dispose the skin and the floating white piths. Strain the water so that all the seeds remain in the bowl. Step 1: Hold the fruit with the stamen end up and score the pomegranate horizontally. Step 2: Place your fingers along the horizontal line and pry the fruit open into two halves. Step 3: Place one half on your palm with the seed side down. Step 4: Hit the skin of the fruit with a wooden spoon until its seeds begin to fall freely. Hit the fruit over a bowl to avoid spilling the seeds and juice everywhere. Step 5: Hit the other half using the same procedure. You will remove all the seeds within 30 seconds. Pick heavier pomegranates because they are the juiciest. The color of the rind can vary from red to reddish-brown but it does not affect the quality of the fruit. However, select fruits with a deep color if possible. 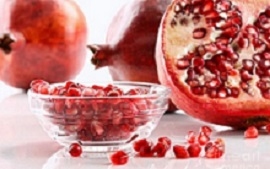 Keep whole pomegranates away from sunlight and at room temperature for several days. You can also refrigerate pomegranate seeds for up to three days or freeze them for up to six months on single layers in airtight containers or tightly sealed bags. But the seeds will lose their shape after thawing. 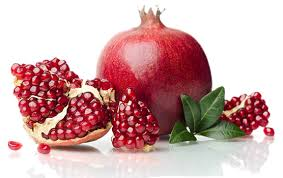 Pomegranate juice can be stored for up to three days in a refrigerator and six months in a freezer. After learning how to cut a pomegranate, you can make juice by blending the seeds in a blender several times. The seeds will break and release juice. Do not blend them for a long time because they will break further and make the juice cloudy. Strain the juice with a mesh strainer and squeeze the pup with the back of a spoon to extract all the juice. Rinse the cloth with cold water until the fading stops. Rub the stain with baking soda thoroughly and then rinse with cold water. Repeat until the stain turns into light blue. Pour hot boiled water on the stain from above in a way that the hot water passes through the cloth and drains. The hot water will remove the stain completely. Server responsed at: 04/26/2019 4:46 a.m.